Welcome to Farm Holiday Dondino Cavriana. The farm house Agriturismo Dondino is located in Cavriana, in the natural oasis of the Mincio Park and it offers a wonderful view of one of the most famous medieval villages of the Morainic hills: Castellaro Lagusello, easy to reach also on foot through various paths surrounded by nature. Our family contributes for three generations to improve the farm and the surroundings characterized by corn-fields, vineyards and woods where lives the characteristic mascot of our farm: the peacock. It is one of the typical animals of our countryside for more than forty years. The hearty welcome and opportunity to have a relaxing holiday in a quiet place are the ingredients that make our farm house unique and genuine at the same time. It is also possible to discover the old traditions and customs handed down from generation to generation. You can try in fact our typical homemade specialties such as jams, honey, pumpkins, potatoes, tomato sauces and limoncello: all these products are the fruits of our fields. The farm house Agriturismo Dondino, obtained from the restoration of an old country building, has got three bedrooms (with four beds each) and a flat for six people at most. Each room has a different colour and a typical style that reminds of a cosy and comfortable place. Each room has got also lcd Tv, large bathroom and an independent and assisted for disabled entrance. The linen is often changed. There is also a big room for breakfast with Tv and a common bathroom. It is also possible to have wonderful walks and excursions on bicycle (you can rent one) in the wide surrounding natural area. On the lawn there are outdoor entertainment for children, recreational activities, a barbecue and a wood-burning oven at your disposal. Cavriana, our village, still has the typical structure of a fortified ancient village: in fact, a stately fortress dominates the village from the high of a hill. Cavriana boasts two important historic-environmental attractions: the park of Villa Mirra and the Romanesque church La Pieve, linked one another by a pedestrian run. In the surroundings the typical medieval village of Castellaro Lagusello, the historical, stately Visconteo bridge of Borghetto, Verona, Mantova, the Lake of Garda and its attractions: Gardaland, Caneva World. 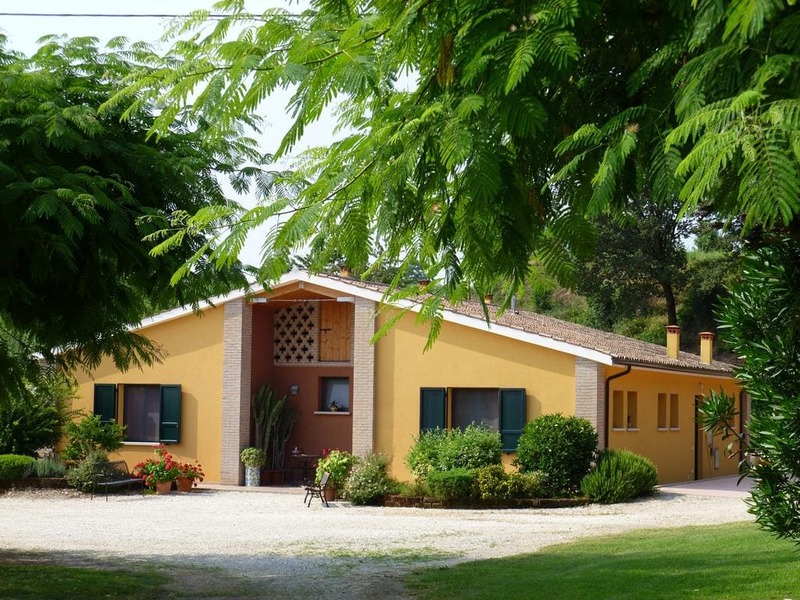 (Agriturismo Dondino Cavriana farm holidays).